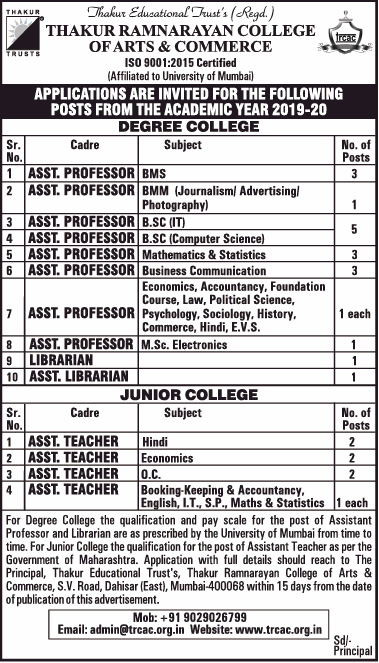 Thakur Ramnarayan College of Arts and Commerce, Mumbai has advertised in THE TIMES OF INDIA newspaper for recruitment of Assistant Professor / Librarian / Assistant Librarian jobs vacancies. Interested and eligible job aspirants are requested to apply within 15 days from 03rd April 2019. Check out further more details below. About College: Thakur Ramnarayan College of Arts and Commerce is a new gem in the necklace of the Thakur group. Backed by the visionary spirit of the Thakur group, this College brings to Dahisar, world class infrastructure – facilities and amenities for a new generation of students. The college will provide a robust platform for those who want to make a career in arts, commerce and science streams. At TRCAC, we shall stress on collaborative learning, individual intellectual development, and respect for diverse points of view. Broad curricular choices shall encourage students to explore personal interests, meet diverse groups across campus, or prepare for specific graduate and professional programs. How to Apply: Interested candidates are requested to send application with full details along with copies of certificates and recent passport size photo to the postal address provided below.